Lakeland, Florida — The Florida National University baseball team split their doubleheader vs. Southeastern University winning 7-4 in game one, HUGE win for the Conquistadors as they snap #1 Southeastern University 15 game winning streak (30-4). and falling 23-1 in game two on Monday, March 26. Records: SU falls to 30-4 overall; FNU improves to 8-18 overall. Records: SU improves to 31-4 overall; SNHU slides to 8-19 overall. Dominic Anagnos: 3-for-4, two runs, three RBI’s. Ivan Nunez: 3-for-3, one RBI. 3 runs, three RBI’s and 2 walks. Dan Valerio: 3-for-4, two RBI’s, four runs, 1 walk. Bryce Oriold-Fraser (W, 2-0): 3.0 innings pitched, two strikeouts, one earned runs. D. Sarmiento: 1-for-3, one run. A. Ruche: 1-for-2, one walk. G. Borelly: 1-for-2, one walk. Southeastern University immediately got on the board with four runs in the bottom of the first inning of game one. A pair of FNU errors gave the Fire a 4-0 lead. Despite the strong start, FNU was able to chip away at the deficit with three runs in the top of the fourth. The Conquistadors, who had five players with multiple hits, notched runs in the fifth and sixth to go ahead 5-4 before closing out the first competition with a pair of runs in the seventh. The Fire answered by scoring six runs in the first two innings of the second game. 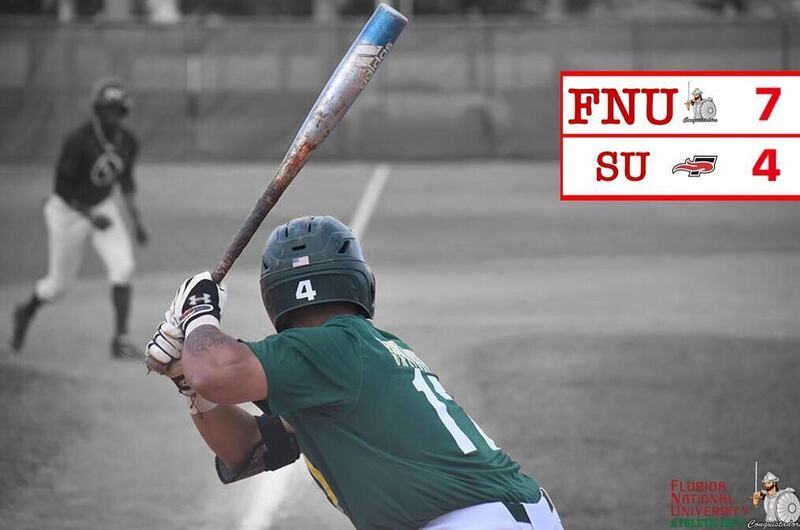 After FNU collected its only run of the contest in the top of the third, Southeastern responded by plating seven in the bottom of the inning. The Fire scored 7 more runs on the bottom of the 5th inning and finished the game with 3 more runs in the 6th inning. The Conquistadors will face Keiser University on Tuesday, March 26th, at West Palm Beach, Florida.